Up to this point since starting guyonclimate.com in early 2017 I’ve posted on carbon pollution coming from far flung places like India and China without specifically reporting on individual sources. Today I will delve into the evolution of one source right in my backyard that is only about ten miles due south of my house. My community and a large swath of Atlanta via the Georgia Power Company relies on the McDonough plant for electricity. I’ve driven by the site in an industrial area off Atlanta road many years ago noticing mounds of coal, coal ash, and seeing Mack dump trucks loaded with coal moving in and out of the facility. A smokestack was emitting black soot. This couldn’t be good for the surrounding communities. Importantly, the plant is located in, yep you guessed it, one of the poorest sections of southern Cobb County. Fortunately I don’t think I have had any ill effects from the plant being located upwind most of the time. My reason for today’s post is that one of my fellow Climate Reality compatriots has brought the McDonough plant back to my attention. It’s quite important that individuals find out where their local electricity is coming from so that organized protests for change can occur if necessary. Breath a sigh of relief if your power comes primarily from solar and wind, but get steamed if your Tesla remains electrified from coal. What’s the point of driving a hybrid or all electric if by doing so more pollution from somewhere gets pumped into the atmosphere or drained into your water? Right? Let’s specifically look at the history of the McDonough plant to see if positive changes have taken place since I first saw the thing in operation a couple of decades ago. Upon Googling the plant I initially saw this: Plant McDonough-Atkinson is named for the late John J. “Jack” McDonough – who was Georgia Power’s president from 1957 to 1963 and for Henry M. Atkinson, one of the founders of Georgia Railway and Electric Company. Georgia Power retired its coal-fired units at Plant McDonough-Atkinson in 2011 and added three natural gas combined cycle units. Well, this is good news. Apparently the McDonough plant is no longer coal fired, being run off cleaner natural gas since 2011, so why are their more complaints as of 2019? State Rep. Mary Frances Williams, D-Marietta, says it’s time for Georgia Power to clean up its act in south Cobb. Williams introduced a resolution in the House this week urging the power company to remove 6.3 million tons of coal ash, a by-product of burning coal in power plants, from Plant McDonough-Atkinson in south Cobb. Co-sponsors of the resolution from the Cobb delegation include state Reps. David Wilkerson, D-Powder Springs; Sheila Jones, D-Atlanta, and Erick Allen, D-Smyrna. According to the Environmental Protection Agency, coal ash contains pollutants including mercury, cadmium and arsenic, which scientists say can lead to cancer, birth defects, neurological disorders, learning disabilities and more. Without proper management, these contaminants can pollute waterways, ground water, drinking water and the air, the EPA says. Unlike a bill, which becomes law when approved by both chambers and signed by the governor, resolutions do not have the power of law, but are used to express the opinions of the Legislature. Williams said she wants to see the coal ash moved to lined landfills far from water sources where they are unlikely to harm humans or animals. 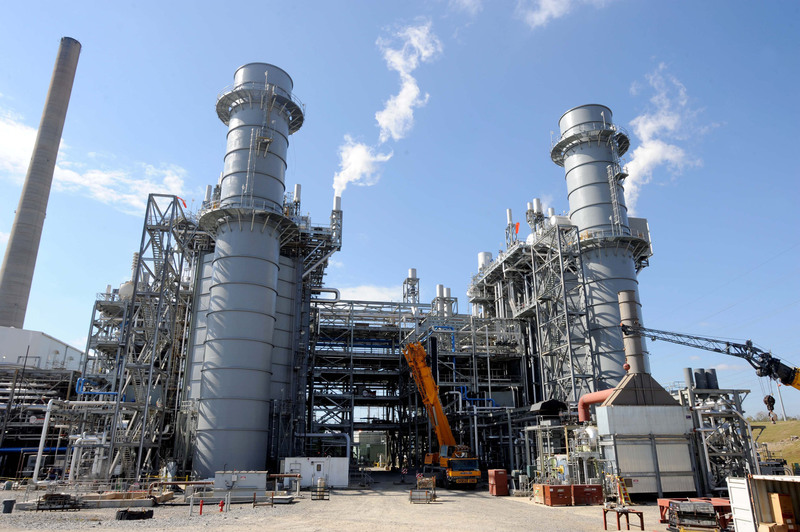 Georgia Power retired its coal-fired technology at Plant McDonough-Atkinson in 2011, and the plant now produces energy through natural gas, supplying power to about 1.7 million homes, according to its website. Georgia Power spokeswoman Holly Crawford said in an email the company announced plans to permanently close all of its 29 ash ponds at 11 sites in September 2015 and is working toward that goal in compliance with state and federal rules for handling coal ash. Crawford said the company is in the process of removing 19 ash ponds located adjacent to lakes or rivers with the remaining ten being closed in place using advanced engineering methods and closure technologies. Georgia Power will cease placing ash in all ponds this year, she added. Georgia Power did not provide a timeline for addressing the South Cobb site. “Ash pond closures are site-specific and balance multiple factors, such as pond size, location, geology and amount of material; and each closure is certified by a team of independent, professional engineers,” Crawford said. Crawford also said the company keeps a close eye on pollution levels and has not identified any health concerns. “Since 2016, Georgia Power has installed approximately 500 groundwater monitoring wells around its ash ponds and on-site landfills to actively monitor groundwater quality. Monitoring is being conducted in compliance with federal and state laws and regulations. The company has also engaged independent, third-party contractors for sampling and accredited independent laboratories for analysis. The first round of testing was completed with results published in August 2016, more than 18 months ahead of federal requirements, and the company continues to post testing results on Georgia Power’s website and report them to Georgia EPD. Based on the extensive data collected, the company has identified no risk to public health or drinking water,” Crawford said. Williams said she acknowledges Georgia Power is excavating the ash ponds, but said that doesn’t change the fact that they are leaving coal ash in unlined pits near important water sources like the Chattahoochee. “The monitoring of the wells is mentioned in Georgia Power’s response, but not the results,” Williams said. “Georgia Power’s self-reported data from their own monitoring wells clearly indicate that the groundwater at the plant is contaminated with coal ash pollutants and unsafe. Georgia Power mentions testing results published in August 2016. The self-reported data and results that I am referring to is from monitoring data that became publicly available in March 2018 pursuant to the EPA’s federal coal ash rule, also known as the coal combustion residuals rule. “All we are asking is that safer methods of coal ash disposal be used at Plant McDonough — as has been done at other plants,” she added. Obviously the quick answer to my last question is dirty very toxic coal ash. Georgia Power has been negligent or reticent to incur additional costs of disposing the stuff that can easily leech into ground water sources causing cancer. Fission nuclear power’s big downside is radiation. Beyond climate change pitfalls coal fired plants are just down right poisonous for surrounding people. I’ll let all reading my posts know what happens to Plant McDonough’s residual coal ash ponds. Despite being run off cleaner natural gas, which is also a greenhouse pollutant, I’ll be pushing for the thing to eventually be closed even if I have to hold a picket sign from my wheelchair along with the rest of my local Atlanta Climate Reality chapter. Wouldn’t it be wonderful if the entire industrial site were converted to a solar farm? I’m sure that Georgia Power could profit off that. We will see. Left: fifteen years ago today, Hurricane Catarina became the South Atlantic’s first hurricane on record with 100 MPH winds as a remarkable Cat.-2 cyclone. Right: Today, another rare tropical storm is swirling nearby.